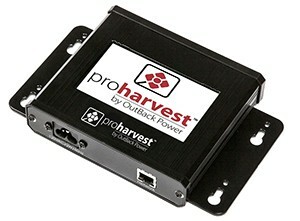 The ProHarvest Communications Gateway adds a wealth of monitoring and control when combined with a ProHarvest Inverter. The gateway communicates with local inverters over the power line using a proprietary communication method that is robust and reliable. Once connected, it will log data and store it on an internal memory card. Information may be accessed through the touch screen, or over an Ethernet network.